This book is the first comprehensive account of contractual estoppel. Contractual estoppel is a new and exciting development in the common law, widely employed and of considerable practical utility. The concept has been noticed by academics, mostly to be criticised as anomaly, misnomer and an objectionable policy choice, and commentary on the concept has been limited to recitation and critique of a few principal cases. Yet this book examines numerous judicial decisions which apply or discuss contractual estoppel, and offers a full and systematic exploration of its origin, principled basis, practical applications and limits. 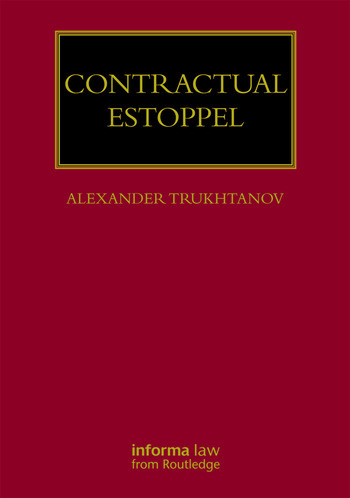 In this new title, the author, Alexander Trukhtanov, responds to policy objections and seeks to answer the charge that contractual estoppel is a misnomer, anomaly or distortion of reliance-based categories of estoppel, by showing that contractual estoppel is its own category of legal estoppel. The book is a single point of reference for a systematic and organised exposition of the subject and an explanation of how it fits into existing law. It is practice-oriented but engages with important conceptual points. Contractual Estoppel will be of interest to practitioners, whether draftsmen, litigators or advocates, as well as academics and post-graduate students of contract law.